In 2014, Arsenal announced a new, long term partnership, with Puma. A deal worth £150m, or £30m over 5 years. It was, at the time, one of the largest deals of its kind in football. Arsenal had been with Nike for 20 years, but in the early 2010’s, had decided to seek a new kit manufacturing partner. Adidas were in prime spot and were expected to sign a deal, until Puma swooped in late, gazumping the money Adidas had put on the table. At the time, Cardiff City and Newcastle United were the only Premier League clubs to have their kit made by Puma, so the Arsenal deal was a massive coup for the German company. “Arsenal represents a major commercial and marketing opportunity to reinforce Puma’s credibility as a global sports brand,” chief executive Bjoern Gulden said in a statement. It is clear that Arsenal are getting well below from Puma than what they could command in the current market. Half the value of Chelsea, 40% of the monster Manchester United deal. Not much more than the likes of Liverpool and Tottenham; whom we sell significantly more shirts than. One interesting thing to note is the Chelsea deal. It is massive. Worth £900m at the time. But it is also a deal signed until 2032. Whilst they might be getting more than they would “naturally” command now, you have to think in 5 years time, that deal could be considered poor. Clubs usually sign 5 or 6 year deals, to enable themselves to not be caught out if there is jump. Arsenal suffered when they signed a long term deal with Emirates to help finance the stadium, and found themselves receiving a lot less than other sides in commercial revenue. The Chelsea deal will be judged in the course of time. Despite being fairly average, Arsenal are still amongst the runners for most shirts sold. It is this that makes Arsenal such a good proposition for manufacturers, rather trophies won. Reports are that Puma and Manchester City have entered negotiations. With Manchester City looking to cut their £18m a year Nike deal short, and sign a £45m one with Puma. This rumour is interesting, as it shows that Puma are concerned about not sponsoring a top Premier League team. Were the Arsenal deal to end, they would not have a major club in England wearing their shirt. It also highlights how poor Manchester City are still seen abroad. Despite running away with the league this year, the deal with Puma will still be a lot less than the Chelsea and Manchester United ones. Puma base what they are willing to pay on the shirts they can sell – and not on the trophies won. Manchester United outsell every team in the Premier League (and the world) hence where there deal is the biggest. It should also be remember that clubs do not get a “cut of global sales”. The only extra money a club makes on top of the licensing and manufacturing agreement is when they sell the shirts in the club shop or online. “Buy Direct” as Arsenal say. 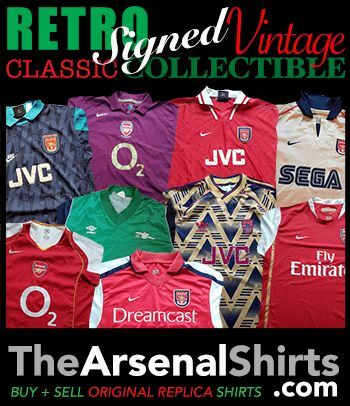 When it comes to selling shirts, Arsenal or Manchester United are no different to Sports Direct or JD Sports. They make their money on the difference between what Puma (or Nike) sell the shirts to them for, and what they sell them on to us, the consumer, for. Despite not winning a league title since 2004, Arsenal will still be considered by the likes of Nike and Adidas as a premium band. Someone that they want to supply, and pay big bucks to supply. Only 5 clubs in world football sell more shirts. Barcelona have recently signed a £150m deal with Nike. Manchester United’s is at £75m a season. Chelsea £60m a season. Adidas pay Bayern Munich £65m a season. It is the Bayern Munich deal that is most comparable. Arsenal sell a similar amount of shirts as the German giants, and Adidas want a London Premier League club after losing Chelsea to Nike. The deal will be done between Arsenal and Adidas. Munich is the jewel in the crown for Adidas. A German based company, German’s biggest team. It is a match made in heaven. Despite this, they get less from their deal than Manchester United. Ultimately it comes down to business. Manchester United sell more shirts, so get more money. Personally, I can see Arsenal signing a deal with Adidas in the region of £60m a season, doubling our current Puma deal. I also do not think we will join Chelsea in a 15 year long deal. We should look at the Manchester United deal, expiring in 2024, and look at an expiry date of around that time. In 2024, Manchester United might double their deal again, taking themselves to £150m. That would dwarf every other side in the Premier League. Arsenal would not want to be sitting there in 2024 on £60m a year with 8 years to run, whilst Manchester United have a £150m a year deal. That could create a long term deficit of £720m. A lot of money. Arsenal need to close that commercial gap between themselves and Manchester United. House deals with Emirates and a new kit manufacturer need to be just the beginning. This entry was posted in Arsenal and tagged adidas, Arsenal, Chelsea, Manchester City, Nike, puma, She Wore, She Wore A Yellow Ribbon on March 17, 2018 by keenosafc.